Earn $13.49 in VIP credit (1349 points)What's This? Tubus Logo racks are strong, beautiful and lightweight. It's no surprise these German-made carriers have become the basic equipment of any top quality touring or commuting bicycle. The new Logo Evo model is geared toward riders with heel clearance issues, making it a great solution for smaller bikes or racier frames. An additional pannier mounting bar provides a lower center of gravity for improved stability with heavy bags. This design also keeps the panniers away from the upper area of the rack for easier top storage. A new lower strut design provides easy lower attachment with bags of all types. The Logo Evo has also undergone extensive testing with the industry's leading designs for totally vibration-free performance with all common pannier attachment systems. The Evo model features the new 3D attachment feet for improved impact absorption and integrated screw attachment. Thin walled 25CrMo4 steel tubes easily tote enough gear to take you across the country - or around the world - without tacking superfluous weight on to your rig. New super light mounting hardware drops a few more grams. The load capacity for the Logo rack is an impressive 88 lbs (40kg). Weight: 600g without included hardware (138g). Fits bikes with 26" to 700c wheels. All Tubus racks are backed up by a 30-year Worldwide Guarantee against technical failure. The Logo and other CrMo models are also supported by an additional 3-year Mobile Guarantee against technical failure. This means, within the first 3 years after purchase date, a broken carrier will be replaced and a new one will be forwarded to any place on earth - wherever you are - for free. Please see the Tubus website for warranty details. Great rack. Have been using it to carry 60lbs of groceries regularly. Great rack. Have been using it to carry 60lbs of groceries regularly. No complaints. love this rack because it is very stiff and eliminated bike shimmy when moving. I have a new specialized AWOL touring bike that was set up with an inexpensive rear rack. When the Ortlibe panniers were on, the bike would have front end shimmy over 15 miles per hour that was very annoying. This rack was noticeably stiffer and eliminated the shimming. Even though the price was also stiff, I am very pleased with the way this rack lowers the center of gravity and makes the bike handle better. I put this on my 2017 Budnitz No3 - it fit perfectly above the flat fenders and no issues with clearance with the fender hardware. I have pannier bags on it for my 44 mile round trip commute to work. would buy again. 4 stars on value only because I dont understand why all racks cost as much as they do. I replaced my Surly rack with the Logo Evo and, so far, am happy with the decision. Also made of steel, I expect the rack to hold up to a long tour. The lowered side bars for panniers are great... this allows for my Ortlieb Back Rollers to go on the side without blocking access to the top flat part of the rack. In my case I am using an Ortlieb Rack Pack across the back... works great. The rack is much narrower than the Surly (where there's clearly some of the weight savings), but it makes no difference using the Rack Pack (might be worth considering for someone planning to bungee a bunch of stuff to the rack). The main complaint I have is the hardware... all of the bolts are Torx instead of Hex, requiring that I bring a Torx wrench on my tour. Likely, I'll end up re-installing using Hex hardware so I can stick with just allen wrenches. Also, installing the stabilizing bars was very tricky on my Disk Trucker... actually had to use pliers to turn the Torx screws because the angles were impossible to fit a wrench. It looks really nice, very intuitive design, and sturdy. What initially drew me to the rack was the warranty. They'll replace it if it breaks no matter where you are. I also really liked I could attach the bags in a high or low position. 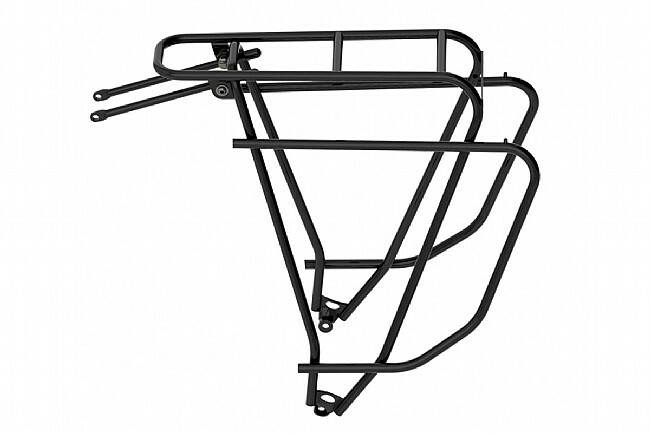 I own two of these racks, with one on my Surly Disc Trucker road/touring/commuting bike, and the other on my Salsa Fargo bikepacking rig. The build quality is superb, and at 21 ounces they are surprisingly light for a rack rated to carry 88 pounds, which is far more than I ever hope to have to carry. I like the lower side rails that let you mount panniers for a lower center of gravity and better stability. Tire clearance is excellent, even on my Fargo, which has a 2.3 inch rear tire and wide fender. I prefer tubular steel for its superior fatigue strength and durability as compared to aluminum alloys, which can be important on bikepacking trips in rough terrain when you can be several days from civilization. You can beat a steel rack. The lowered mounting bar for my panniers was the main reason I chose this rack, and of course the durability of chromoly steel. Itll hold 2.5X more weight than my previous aluminum rack. I also have the Tubus Tara Lowrider rack for the front which has been awesome and I will continue to purchase Tubus if the need ever presents itself. These racks fit my Surly LHT like they were designed specifically for it!